﻿ 5 Simple Strategies to Improve Your Email Open Rates » Red Mango Marketing! « What Really Inspires Owners to Start Their Business? Email marketing works because it allows you to reach customers (and potential customers) in the place they go every day — the inbox. But once you get to the inbox, how do you make sure your emails actually get opened? This is a question we hear a lot. Even if your business already has a strong open rate, once your numbers start to flatten out, you’re probably wondering what you can do to nudge them in the right direction. Improving your email open rates doesn’t require a lot of heavy lifting. With a few simple tweaks, you could be on your way to higher open rates and more opportunities for your business. Your subject line is one of the most important lines of your entire email. Similar to an article headline or the tagline of an ad, your subject line is meant to draw people in and get them interested in what you have to offer. 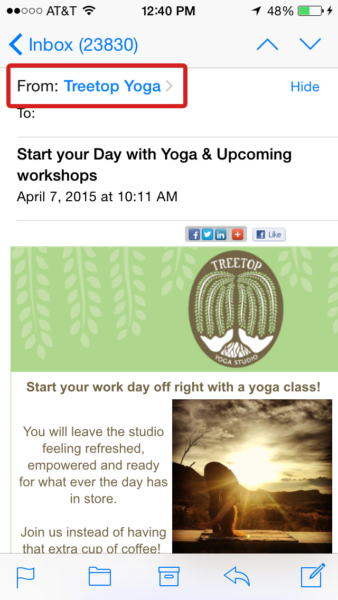 Generic subject lines like “April Newsletter” or “News from [Your Business]” probably aren’t going to cut it. 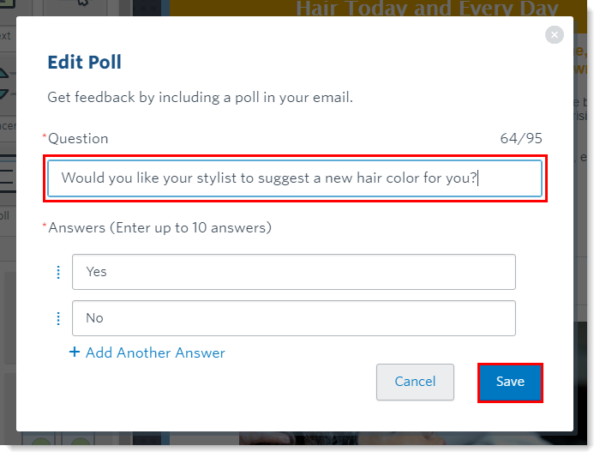 The question: Using a question in your subject line is a great way to make a more personal connection with the people viewing your emails. The command: Sometimes it pays off to be more direct with your audience as a way to get them to take action. The teaser: Believe it or not, people love cliffhangers. And if crafted correctly, the teaser tactic will pique interest and entice subscribers to read on. The list: Lists make it easier for people to consume the information you’re sending out. They also give you the chance to demonstrate your points in a more compelling way. The announcement: Subject lines don’t have to be complicated, especially if the goal of your email is to announce something new. Be straightforward about what your email is about. Do you know what you used as the “from name” in your last email campaign? What about the “from email address”? The from fields let readers know who an email is coming from. If you’re not thinking carefully about the information you put into these fields, you could be making it difficult for people to recognize your email when it lands in their inbox. People are skeptical of emails when they don’t know the sender; they could be less likely to open and more likely mark your email as spam. Use a familiar from name and from email address that represents your business. If possible use an email address with your business’s name in it, rather than a personal email. Tip: Here’s how to customize your email header and footer within your Constant Contact account. There are certain times of days when your readers are more likely to open and read your emails. One of the easiest ways to find the best time to send is to segment your list into 2-3 equally sized groups and send the same copy of your email during different times of the day (morning, afternoon, and evening). Try this test for a few different mailings and keep track of which version gets the highest open rate. This will take a little extra time, but over the course of a few weeks, you should have a strong indication of when your readers are most likely to open. To help you determine the best day/time to send, we analyzed a collection of Constant Contact customer mailings. You can use this chart to identify a good time to send, based on the results of others in your industry. You may know and understand the needs of your customers, but how much do you really know about the people on your email list? Do you know what topics they’re interested in? Do you understand why they joined your email list? Do you have a good understanding of what questions they’re asking and how you can help address them? Understanding your email audience is critical to getting the results you want from your email campaigns. When you learn more about your list, you can start to target your contacts with more relevant information. Survey: Send a short 1-3 question online survey to find out what topics your readers are interested in learning more about. Poll: Ask readers to take a quick, one question poll. You can add a poll right within your Constant Contact account. Reports: Use your click reports to see which links are getting the most clicks. You can also get a breakdown of who is clicking to read each piece of content. In-person: You’re interacting with customers every day. Get in the habit of writing down customer questions/feedback so that you can refer back to it when you’re stuck for email ideas. Successful open rates start the moment someone joins your email list. It’s your responsibility to make sure they understand what they’re signing up for, and then follow through with the expectations you have set. What is the value of signing up? What can they expect to receive? How often will they hear from you? In addition to your sign up form, take a look at all of the ways you’re adding people to your email list. Are you getting permission before adding new contacts to your list? You’ll get a much better response rate when people opt-in to join your list. You’ll also avoid possible spam complaints that could keep you from reaching the people on your list. Tip: Looking for easy ways to grow your email list? Here’s how to be sure you’re doing everything you can to build your email list. What’s one thing you could improve in your next email campaign? When it comes to email open rates, small improvements can make a big difference. Want to do more with your subject line? Improve your open rates with these 12 subject line tweaks. Want to figure out the best time to send? Read this post: When is the Best Time to Send Your Email Marketing Campaign? Want to learn more about how to collect email addresses the right way? Get started with these list building techniques. Get started today! Sign up for your free 60-day trial of Constant Contact’s email marketing. Already have an account? Log in to put it to work! 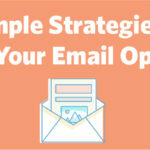 The post 5 Simple Strategies to Improve Your Email Open Rates appeared first on Constant Contact Blogs. This entry was posted on Tuesday, May 2nd, 2017 at 8:00 am	and is filed under Email Marketing, News & Updates. You can follow any responses to this entry through the RSS 2.0 feed. Both comments and pings are currently closed.